Behind every origin story in Spain, there seems to be an element of nonchalance, of the proverbial bread or sausage placed atop the royal beer glass as a (voila!) tapa, just like a casual exploration into the anatomy of the frog which birthed an electrifying discovery that would set alight entire cities. But, perhaps fortunately, the Spaniards have historically been cultural, rather than technological, entrepreneurs. And so begins the story of the first falla– as the winter of 1497 departed from Valencian shores, an artisan decided to burn down the wooden structure which had been holding his oil lamp in place, as it was no longer needed. In the flames, Valencians felt the spirit of something more significant- the joy of a new spring arriving, of frigid structures collapsing and giving way to communal warmth. Year by year, the burning became more deliberate and locals began to place rags of clothing, utensils and furniture as mundane symbols of their hopes and woes upon the wooden pylons, until it became tradition. Like with most traditions, it is not the history that makes the event, but the event that makes the history. My account of the festival has begun with the final night, la Cremà, when every falla is burned into the night sky, and the wind sprays cinder and ash among the faces of the masses of spectators. 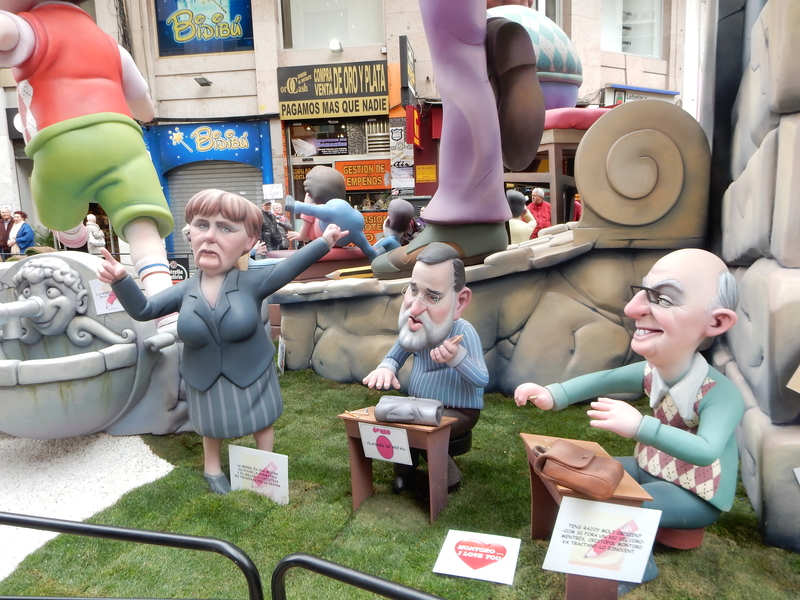 Most fallas are built in the modern fashion of a strong wooden support, styrofoam filling and an exoskeleton of wax, paper and fragments of word. Each burning begins with a small pyrotechnic show, which often sets alight the whole structure, and once the flames encircle it, the two outer layers burn surprisingly quickly. It is as if it is there one moment and the next it is not. The same goes for the crowd and the vibe- everyone goes home surprisingly quickly after the main cremà around 1am. They have to return to work the next day. Yet Las Fallas overall represents a five-day festival in which everyone acts almost as if there is no tomorrow, in the desperation that it will be over before long. The opening night is loud and bright but only hints at things to come. Every day has its Despertà, in which brass bands and firecrackers wake everyone up for duty at 8am, and its Mascletà, when daytime fireworks set the main square alight and turn the whole city into a sonic spectacle, waking up the slackers in the process. The night fireworks get increasingly more impressive until the Nit del Foc, the second-last night, which also has the most intense street celebrations. 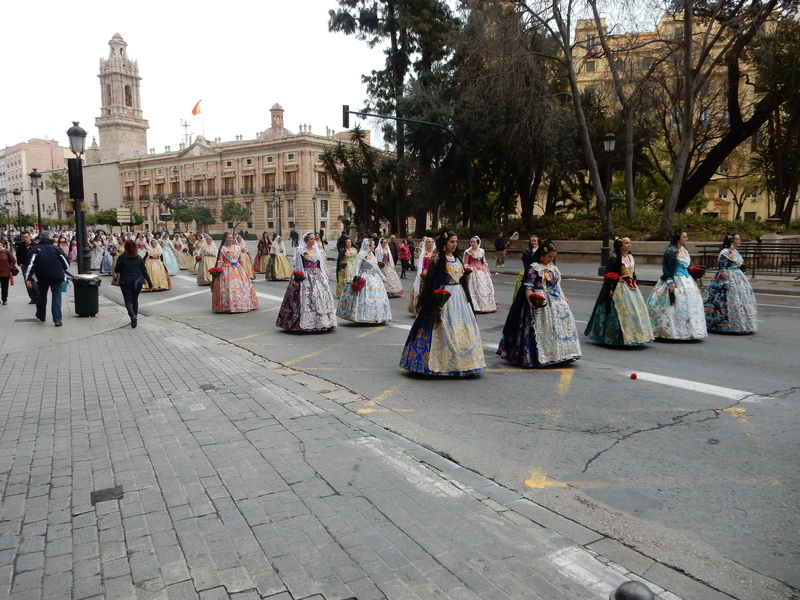 Every day, there are parades of all sorts, all based around the main Ofrena de flors in which women take flowers to a central square which then shroud the statue of the Virgin. And just before la Cremà, there is a huge pyrotechnic parade called La Cabalgata de Fuego. This year, the last one was sadly cancelled because there was too much wind. But that didn’t stop the final burnings, which seemed to overcompensate. Firetrucks were at attention around the statue of a Japanese-looking man in a tiny square in the centre, and in fact continually doused the air around the terraces as the wind kept blowing the flames dangerously close to them. I stood as close to the barriers as I could, and walked away soaked and full of cinders. Every evening, I went with a different group of people to wander the streets and find new sensual overload. It was as if the police were also on their day off. Everybody was drinking freely, chorizos and morcillas were jostling for consumption, old men and young children were throwing fireworks that would scare off temperate Madrileños, and blind eyes being turned to whatever other activity was taking place. 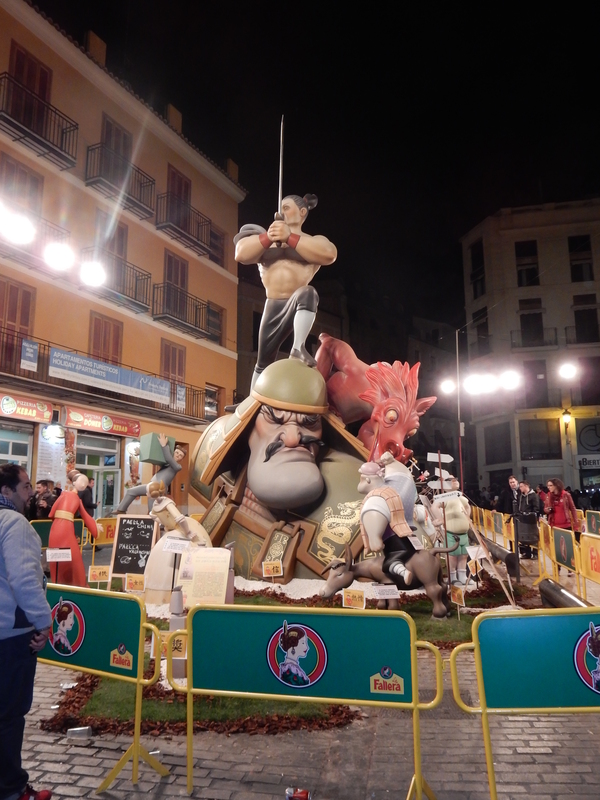 Some of the more adventurous would wander further to check out the fallas near the beach, but by and large the spectacle was enclosed within the tight and normally placed streets of inner Valencia. 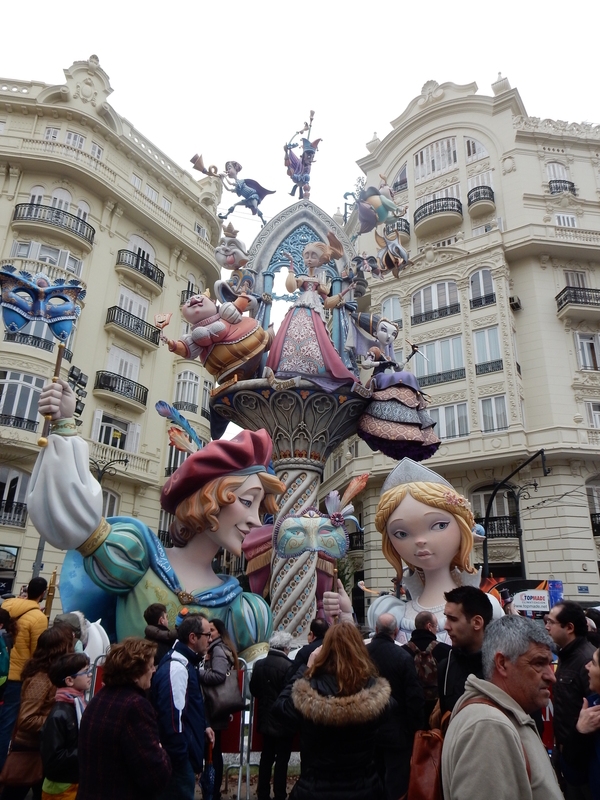 The fallas themselves were cause for much wonder and speculation. Funded, designed and built by local committees of artists and their benefactors, they continue to reflect much of the hopes and anxieties, vision and critiques of the Valencian community. 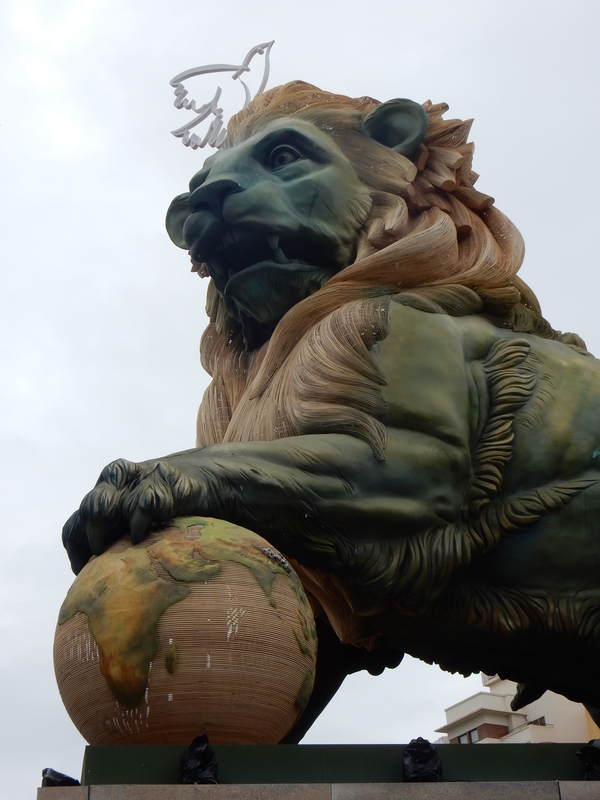 The central statue is surrounded by ninots, smaller statues that complete the theme (and could often stand on their own as accomplished works), also destined to be burned, besides a select few that are chosen each year and put in the Fallas museum. Their message was often profoundly cultural, occasionally universal, and more often than not satirical. Satire is here a natural reaction not only to the absurdities of modern life, but to the excess of the festival itself, an excess whose weight can only collapse on its own itself. Almost all fallas depicting happy, traditional scenes also had a dejected, perhaps slightly overweight, kid lurking in the background or dropping his trumpet, or a woman staring longingly at the wrong man. The prevailing style was thus a kind of comic surrealism. 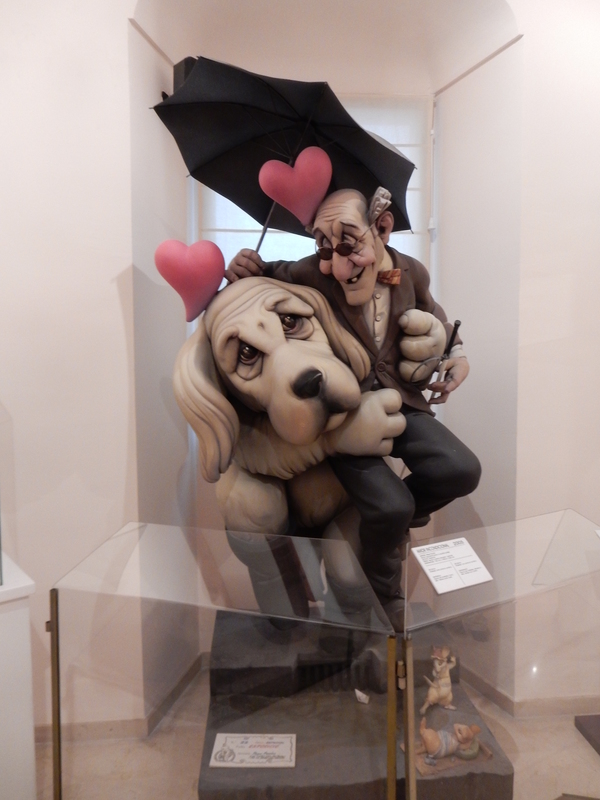 Many fallas, depicting scenes from movies and Hollywood stars (such as the festival’s winner) conveyed an exaggerated pallor of youth that perhaps foreshadowed each figure’s imminent demise beneath the flames. 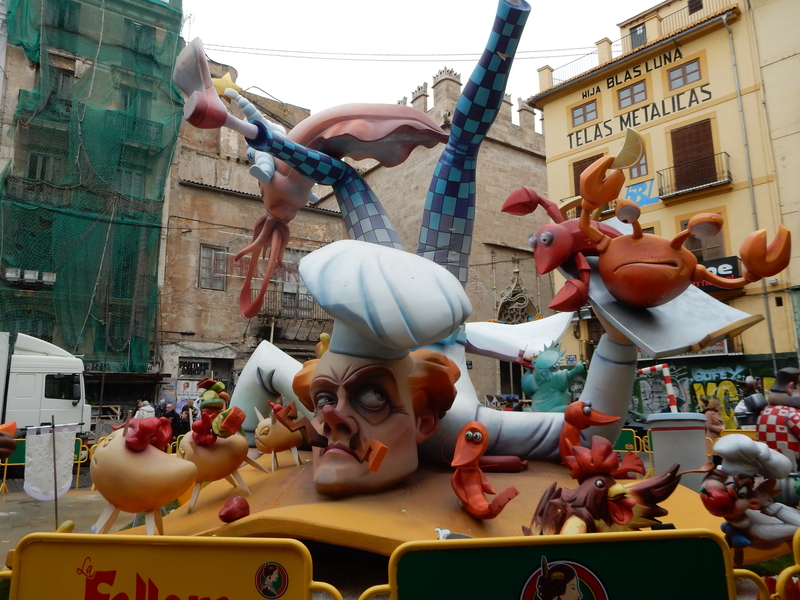 This culinary-themed falla depicted a chef fallen on his chest, and losing all sense of balance. It was lined with ninots of menus naming stereotypical dishes alongside parodies of the latest fusion craze. Some of these were depicted in typical larger-than-life fashion, prawns riding on angry potatoes or loaves of bread, all mismatched. Behind him was the Statue of Liberty bearing burger and fries. Sliding down his legs on a fugitive cuttlefish, and towering over him, sat the Michelin mascot. This falla was clearly a commentary on the contradictory pressures experienced by today’s chefs by tourism and food journalism, and hinting that the greatest victim was perhaps the food itself. In another, ninots depicted a typical classroom scene, except the participants were European leaders. Angela Merkel was happily teaching a class to two figures I failed to recognise, perhaps hinting at the passivity of Europe’s leaders before the Chancellor’s patronising and indoctrinating lecturing on austerity politics. On the theme of European politics, another quite opulent falla introduced itself with the motto “siempre emerge lo que sumerge (what submerges always emerges)”, conveying tentative hope amidst the tumultuous situation in which Europe finds itself, then suitably hiding this message beneath huge statue depicting a scene from traditional bourgeois Europe. Suggestions to change the date of the festival in order to encourage more tourism have thus far been resisted. This reflected a wider pattern I noticed throughout my time there and in nearby Barcelona- curiously little word of the festival, and very few promotional materials. If anything, Valencia attracts tourists year-round for similar reasons to the rest of Spain- paella, flamenco and its old (but unspectacular in Valencia’s case) architecture. If it is quite well known among the Spanish, the message is not conveyed to outsiders in the same way as with, for example, the San Fermin Festival or La Tomatina. The hostels were busy but by no means booked out, as a few friends discovered. Perhaps locals have wised up to the effect that tourism has had on much of the nation. Cities like Barcelona, Madrid and San Sebastian have, despite resisting the process of touristification surprisingly well compared to other European cities, suffered much of the disorder and alienation that comes with welcoming hundreds of thousands of American and British tourists every year. We’re all familiar with this process- just like with gentrification, the restless subject, in search of the elusive charm or spark of a particular place, objectifies and commodifies its culture until it has undermined the economic base and authenticity of this je ne sais quoi. 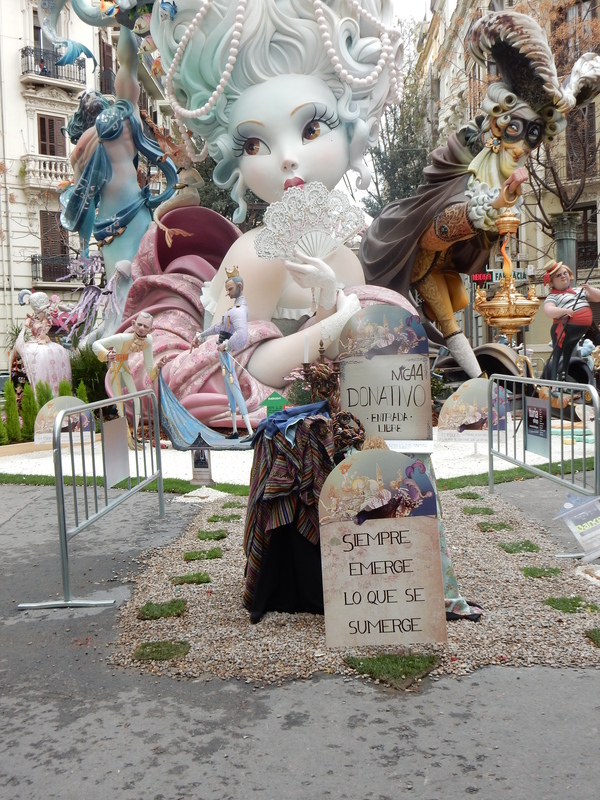 If that’s the main reason Las Fallas remains one of Spain’s best-kept open secrets, then perhaps I shouldn’t be writing this article. Yet nothing about the festival felt like a wall keeping out the latent forces of globalisation. In fact, this could be one of those cases where a city is so saturated with cultural energy that tourism finds little space to accommodate to its own wishes. No amount of drunken rowdiness could compete with the noise generated by the fireworks shows or the locals singing and leading small parades in a Chinese dragon dance. Moreover, it appears as something that the whole town has a place within- whether that be organising family fundraisers to fund the various committees in charge of making the fallas, marching in virginal attire with roses to give to the virgin, or channelling one’s inner pyromaniac during the burnings. The feeling of open conspiracy was unlike anything I’d previously experienced, perhaps with the exception of the Edinburgh Fringe Festival. And it certainly wasn’t for all outsiders- a few people I met at the hostel complained about the rowdiness of the events and the lack of predictable party/club spots. Las Fallas just about made the latter part of my time in Spain, and convinced me that I should have devoted more time in late March for a few more places besides Barcelona. But no point getting attached to any particular view. All good things come to an end. Tomorrow, and tomorrow, and tomorrow, Creeps in this petty pace from day to day To the last syllable of recorded time, And all our yesterdays have lighted fools The way to dusty death.Out, out, brief candle! Life’s but a walking shadow, a poor player That struts and frets his hour upon the stage And then is heard no more. It is a tale Told by an idiot, full of sound and fury, Signifying nothing. Loved it. Went with a company last year called Stoke Travel, they had a campsite just outside of town and had unlimited beer n sangria. Was sick and would love to go again!